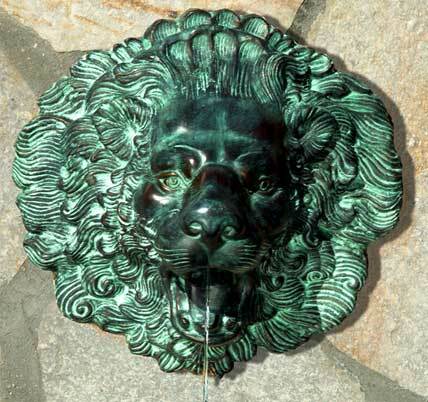 This Lion Face Spouting Wall Plaque Fountain is made of solid brass by hand in the ancient cire perdue, or lost wax method. Artistic and labor intensive, this process builds ultimate value into each fountain. No simple reproduction, lost wax casting is a meticulous evolution. A mold is first created from an original sculpture. A casting is poured in wax, and the wax impression is removed and refined. Once encased, inside and out, in a clay mold, the wax impression is kiln-fired. The wax melts out, and is...lost. The resulting void is then filled with molten brass. Once hardened, the brass casting is removed from the mold. It is buffed, polished and patinized to give the piece its finished verdigris or bronze appearance. The handcrafted nature of these elegant creations builds subtle variations in color, finish, size and shape into each piece. Each art piece is ultimately unique. Brass, 16 inches H. x 17 inches W.